Most businesses today are using their data in some capacity, but not fully. The real challenge is to develop this data into insights that can be applied to increase business value – moving from data to insight to action. This report presents results of a new survey of 105 executives of large global organizations, conducted by Forbes Insights in partnership with SAS. 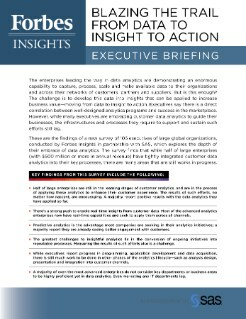 Learn how much these organizations have integrated customer data analytics into their key processes, which areas are still works in progress, and how your organization compares.